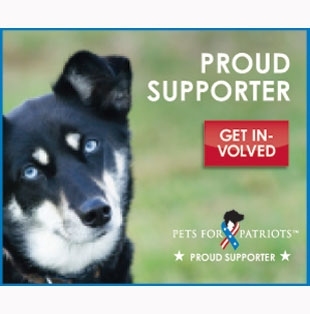 Hinsdale Humane Society is proud to be a Pets for Patriots shelter member. We support the joy of pet ownership, by making it achievable and affordable for the men and women of the U.S. military. Pets for Patriots partners with shelters for pet placement. They also work with local veterinarians for discounted services for the life of an adopted pet’s care and cost reductions on pet basics such as food, toys and essential supplies. Our shared vision is to end animal homelessness by supporting permanent placement of adult dogs and cats with every available, able, and willing military family in the U.S. As one of Pets for Patriots’ shelter members, HHS will offer military personnel special adoption gifts as an acknowledgement of the sacrifices they have made for our country. If you, or someone you know, are a military veteran or active duty personnel, please contact Hinsdale Humane Society for more information on how you can help a homeless animal and adopt a new furry friend. Visit the Pets for Patriots website for more information. For a How to Afford a Service Dog guide, click here.